The Dutch oven does a fantastic job of cooking the beef, making it perfectly tender and ultra delicious. 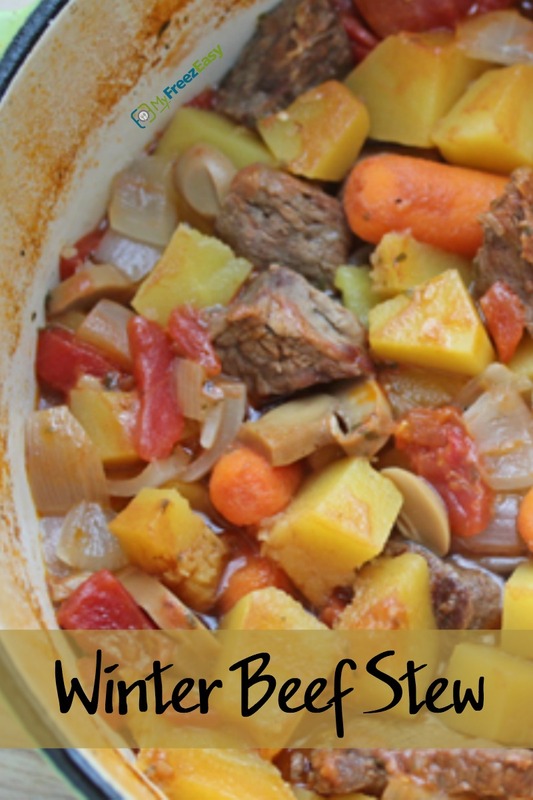 This stew has a wonderful balance of flavors, colors and textures…perfect for your next dinner! Open and drain the can of diced tomatoes and the can of mushrooms. Chop the onion. Peel and chop the carrots. 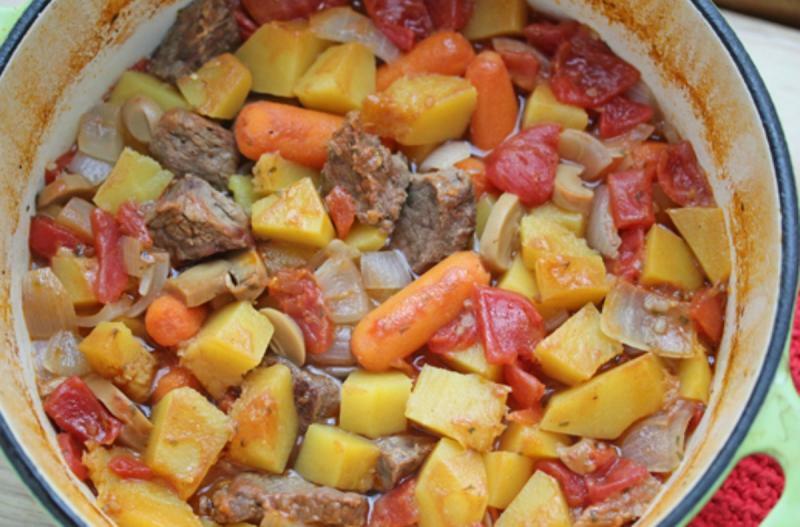 In a large saucepan, heat the olive oil and brown the stew beef. Stir in the chopped onion, chopped carrots, frozen butternut squash, drained mushrooms, drained diced tomatoes, beef broth, Italian seasoning and garlic powder. Bring to boiling and let simmer for 10 to 15 minutes to allow the flavors to mingle. Season with salt and pepper to taste. Serve Winter Beef Stew Chili with salad and dinner rolls. Chop 2 onions. Peel and chop 8 whole carrots. Open and drain 2 cans of sliced mushrooms. Put baggie in the freezer and freeze up to 6 months in fridge freezer or 12 months in a deep freezer. Thaw in the fridge overnight, or a warm bowl of water for about 20 minutes, before transferring all of the contents of the baggie into large saucepan or Dutch oven. Bring to bubbling and cook for 10 to 15 minutes. Serve with Paleo approved sides for complete Paleo meal. Thaw and add contents of baggie to large saucepan or Dutch oven. Bring to bubbling and cook for 10 to 15 minutes.